Consanguineous marriage is a common practice in Iran. The present study surveyed the trend in consanguineous marriage across three generations of Iranians. Index cases, consisting of 400 individuals attending the diabetes and osteoporosis clinic in Shariati Hospital, were interviewed. Data on consanguinity status for 1789 marriages within the index cases’ families were obtained. Generation 1 consisted of marriages contracted before 1948, Generation 2 consisted of marriages contracted between 1949 and 1978, and Generation 3 consisted of marriages contracted after 1979. Prevalence of consanguineous marriage within these three generations was 8.8%, 16.6% and 19%, respectively, and represented a significant trend (p < 0.001). First cousin marriage was the most common type of consanguinity (69%). Socioeconomic level of families was not significantly related to having a consanguineous marriage. 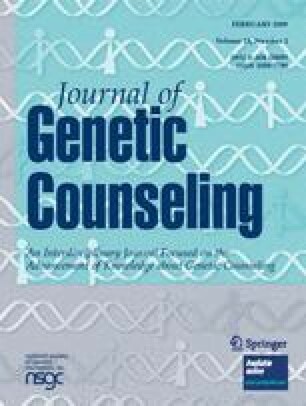 These data suggest that premarital genetic counseling and mass media efforts are needed to increase public awareness about genetic risks associated with consanguineous marriage. This study was part of the second and third authors’ research theses for their MD degrees. We would like to thank all of the doctors and nurses in the EMRC and Diabetes and Osteoporosis clinics who helped us to conduct this study. Special thanks go to Professor Bernadette Modell and Dr. Pat McCarthy Veach for their critical review of this paper.